Alice Ray was going to visit her friend Ann Putnam, but when her mother opened the door and Alice saw the concerned look on her face, she knew that Ann was still very ill. Everyone around Salem Village had been “saying that witches were after her.” There was a lot of talk around the village about witches and the devil. There was also a lot of concern about old Goodwife Sarah Osborne and Goodwife Sarah Good, the two witches who apparently caused Ann’s illness and distress. Ann’s eyes were puffy and had that far away look in them when Alice took her hand and told her that she’d pray for her. Ann started to gasp and cried out, “Get away from me, Sarah Good!” Alice was alarmed and became even more so when Ann asked if she were a witch too. Alice knew there was something dreadfully wrong with her friend, but what on earth was happening? Sarah Good wasn’t a popular woman in Salem and it was “true that almost no one liked her” because she was so strange, but she wasn’t an evil woman. More and more girls started to come forth screaming accusations at her and crying out in pain. John Hathorne, a public Puritan official, waved his hands toward the afflicted children and confronted Sarah. Sarah’s face looked baffled as he asked, “Have you made a contract with the devil?” The shouting continued as Hathorne grilled poor Sarah. Alice wanted to defend her, but became frightened as Ann Putnam might decide to accuse her of being a witch. More women soon found themselves the target of the young girls in the grasp of the devil, including Sarah’s five-year-old daughter, Dorcas. Would Alice be able to muster up the courage to speak up in Sarah’s defense? How many more innocent people would be accused of witchcraft? This tale of Alice, a fictionalized character who lived in Salem Village, Massachusetts in 1692, gives the reader a nice glimpse of what went on prior to the hanging of several “witches,” including the real Sarah Good. The author’s note gives a lot of information about what actually happened, including the imprisonment of young Dorcas. This is one of several in the series, “History Speaks.” The picture book format is very appealing and the expressive, flowing artwork meshes quite well with the tale. The addition of the script for “Reader’s Theater” is an excellent way for children to express themselves and learn about history at the same time. No script has to be memorized as it is a “dramatic reading” that several students can participate in. Full instructions on how to set up the performance are included. In the back of the book is an index, a glossary, and several recommended book and website resources to explore. Additional teaching resources, including printable scripts, sound effects, and a Reader’s Theater teacher’s guide are available on the publisher’s website. 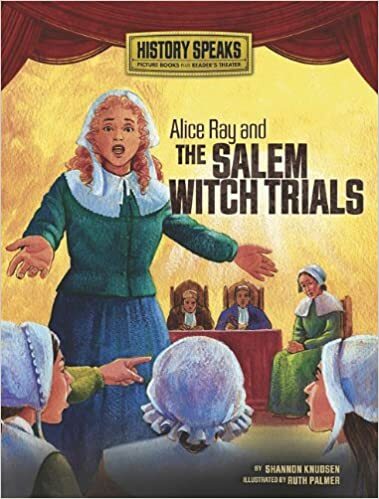 Quill says: This is the fascinating story of Alice Ray, a girl who stood up for her beliefs during the Salem witch trials.